Call it an exaggeration but finding an authentic Papuan food in Jakarta is miraculous. Despite not being the first, my experience at Yougwa officially put Papuan cuisine in my foodie dictionary. Here’s the story. Papua – the enchanting and mysterious land on the eastern part of Indonesia has long been forgotten, left alone with its archaic civilization of indigenous tribes that live within the thick forests that conceal all the exoticism from this island. Papuan cuisine is almost unheard of, especially in Jakarta. The exchange of culinary and cultural influences are perhaps only in-between eastern provinces and they still retain pretty much what has been going on for many years. It’s really up for us whether we want to explore the mystery behind it or rather we just stay back with the mainstream selections. Believing that the former choice is what that makes us foodies, brings us dilemma when it comes to filling the dots on our tailored map as we strive to achieve as many regional cuisines as possible from West to East. Fortunately for us, we found the one and only restaurant specializing in Papuan cuisine (with Manadonese influence) that has been operating in Jakarta for a while now. 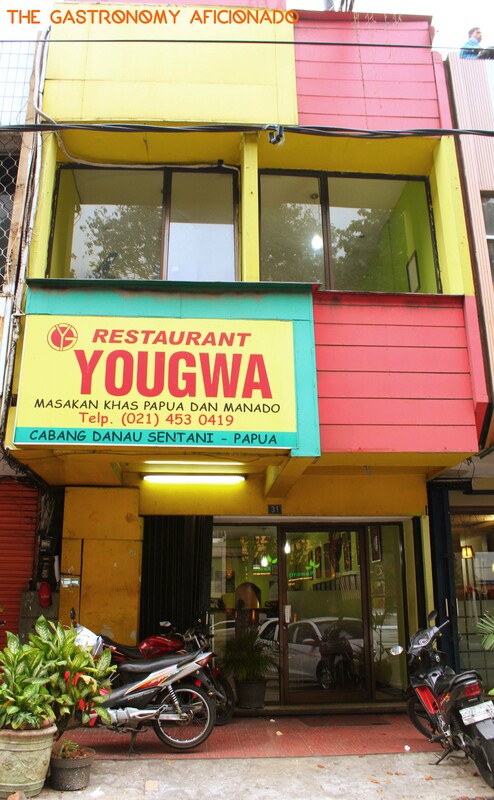 The definition of Yougwa is actually a hut for the assembly of family patriarchs in Papuan tribes, but it was also chosen as the name of the restaurant. Within Kelapa Gading, the particularly ‘thick forest’ filled with eateries, we found another exotic persona that Jakartans must try – at least once. Entering inside, tribal trinkets and written confessions from Papuan notable people who were pleased with their dining experiences at the restaurant decorated the wall. Once a while, Papuan family, as seen from their unique complexions, pass us by and head up and down the stairs to the second floor for perhaps, some sort of reunion party. 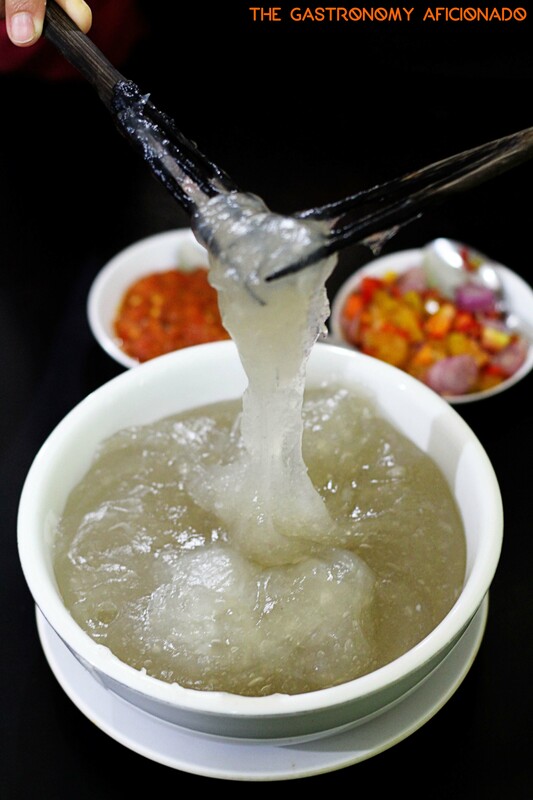 Papeda or the gooey sago porridge, is definitely a must-try as traditional Papuans are not used of having rice as their carbohydrate source. It took us a while to figure how to transfer the deliciously slimy sago from the bowl to our plates using two traditional forks. 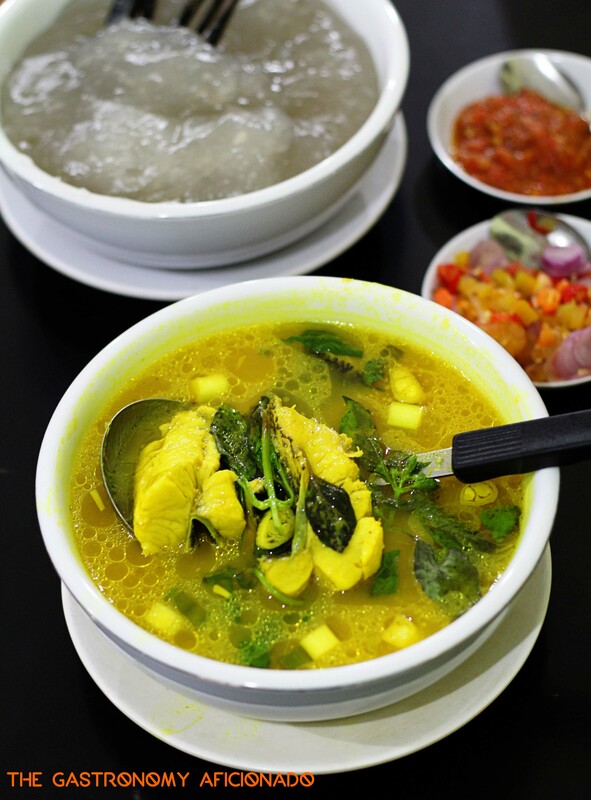 The immediate match for this delicacy is none other than kuah asam ikan gabus or the Papuan sour fish soup, using the island’s native snakehead. Alternatively for the fish, they also have the fried version, grilled, and the Manadonese-style woku alongside different kinds of fish of your choice there. It was quite adventurous for me personally, especially with papeda’s gluey texture and the sour fish soup’s refreshing taste. Perhaps next time, it would also be a good choice to have their traditional grilled fish as the accompaniment of the papeda. Additionally, Yougwa also sells indigenous crackers made from sukun (breadfruit) and keladi (elephant ear) to further enhance your experience here.